The Huntington Library houses Octavia Butler’s papers. Among them is a working draft of Kindred, the first page of which is online. It’s interesting in its differences. 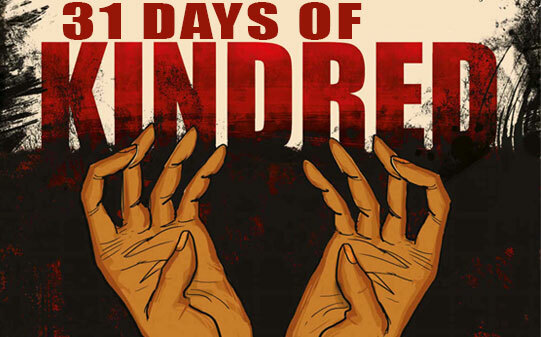 Butler’s original title for Kindred was “To Keep thee in All Thy Ways,” a darkly ironic twist on Psalms 91:11, since in this context “Keep” implicates keeping people as slaves, and keeping a slave owner alive. The story started with the protagonist getting off the bus after failing college tests. The protagonist has kids (who are at their grandma’s house), and walks into the past with nary a dizzy or nauseous feeling. Things are always changing. Nothing is certain. Or, to put it in the words of another Butler protagonist, “God is change.” As John often likes to put it, capitalism hides process. Which is a shame, because there’s something inspiring about seeing that even geniuses like Butler have to put in work. If this blog has offered anything, I hope it has offered a glimpse of the process of adapting the graphic novel–the thought and work and collaboration that went into making it. The book is released tomorrow, and I understand it’s already started shipping out to people that pre-ordered it on Amazon. Currently Amazon lists Kindred: A graphic novel adaptation as a best seller in the “Graphic Novel Adaptations” category, so thank you to everyone who’s ordered the book, either through book sellers or your local comic shop. I hope people like it, and I hope–if this is your first encounter with the work of Octavia E. Butler–that you seek out her many novels and short stories. You will not be disappointed. But, on a slightly more selfish note, I hope you like it so I can keep doing this work. I mean, I’ll do the work no matter what–I have my own writing and art and other collaborations, of course–but it’s so exciting to be able to have this kind of impact. 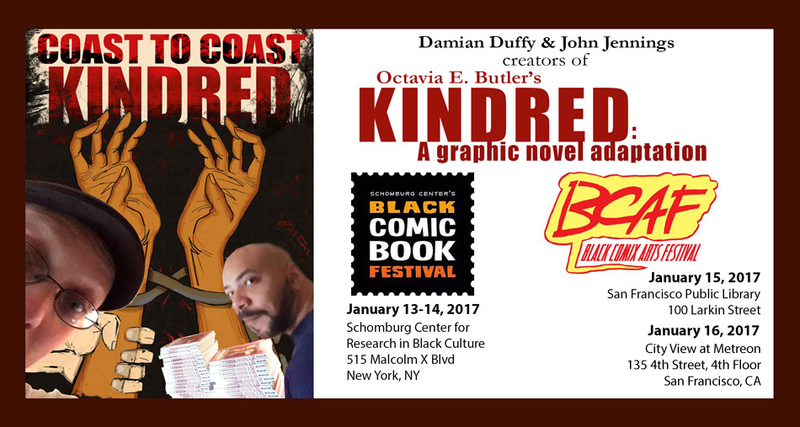 If you’re in either New York or San Francisco this coming weekend, come out to the Black Comic Book Festival in NYC and the Black Comix Art Festival in San Francisco to see me and John (and a jaw-dropping number of big time comics creators) and get yourself an autographed copy. And, while this may be the last of 31 Days of Kindred, this is far from the end of anything. More blogging, and new projects are waiting just round the corner. In February, for example, join me and John and the Magnetic Collection at Lion Forge Comics for Kickstarter of Black Comix Returns proportions. Because this is the just the start. The start of me being a big time successful writer cartoonist person. That’s me. Professional comics creator. I will help bring attention to other artists who need help whenever I can. I will be an activist for social justice, through my art and my actions. And millions of people will read my graphic novels. So be it! See to it! Sorry. Once you’ve started adapting Butler, it gets difficult to stop. Oh, fine, one more Star Wars GIF.